Spotted just a couple weeks before Christmas, this store wisely takes advantage of the year-end peak in sales with these custom hanging signs. Designed to resemble a gift tag, this is sure to catch the eye of passersby and get them into the store. Relevant: Red is used throughout the branded retail display. This is a great, simple colour choice which is certainly appropriate for the holidays. Customised: The store has customised the mannequin’s outfits with red accent pieces. This ties together with the custom hanging signs, with the result being an impactful window display. Businesses should take note of small changes they can make to connect signage to their interior and stock. This will lend a sense of cohesion to the store. Effective: Featuring the text “If you can’t stop thinking about it…buy it” works well. The signs encourage customers to give into their shopping desires and is great at driving impulse purchase. This improves sales. 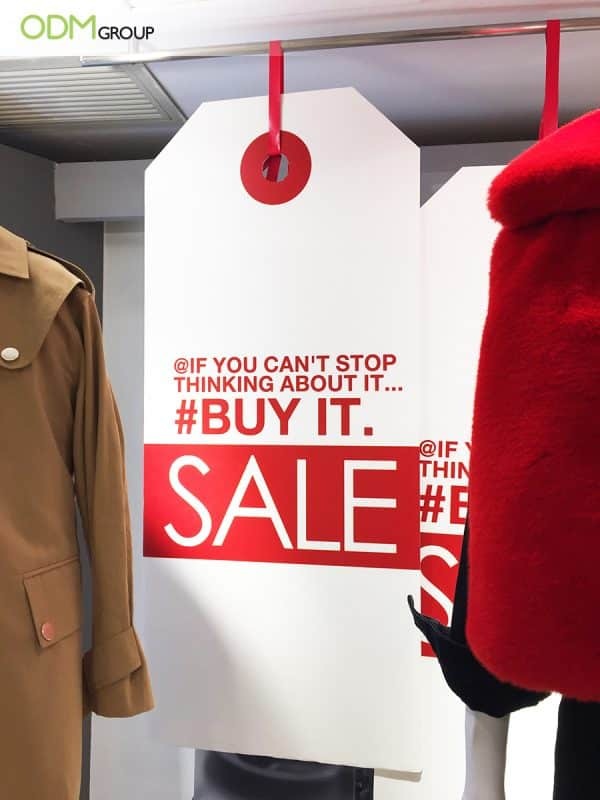 ‘BUY IT’ is especially impactful, in a larger bold font. Commands have been proven effective at directing consumer behaviour so it was smart to include one. Reusable: The design is general enough that it can be reused for future promotions. 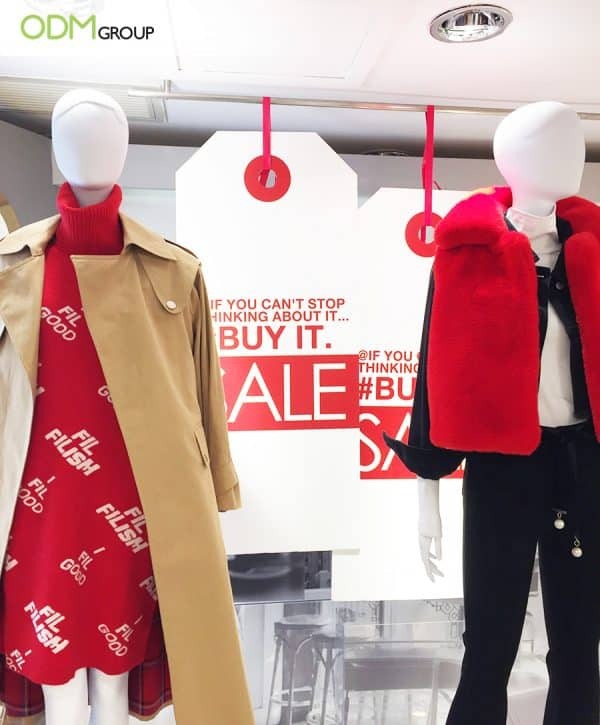 Because of the time of year, the colour red and tag design remind shoppers of Christmas. However, nothing about the design obviously connects to Christmas. Using these custom hanging signs again will allow this store to get the most out of their investment. Ensure that your custom hanging signs are relevant to the target audience. We spotted this display in a Chinese mall. The store should consider – and research if possible – how many of their customers speak English. As there are two identical custom hanging signs used in this store display, we would suggest printing one in Chinese so as not to exclude any potential customers. Stand out: For many, these signs will be the first thing they notice about your store. For others, this may be their first exposure to your brand. Your signage will be a key deciding factor in whether or not they come inside. Consider what of value you can promote to turn passersby into customers. A complimentary gift with purchase would work well as an incentive. Tell a story: Begin with a relevant and on-brand theme. Next, brainstorm different concepts. Be subtle: The message of your custom in-store display does not have to be too obvious. This store recognises this. Instead of writing ‘Merry Christmas’ or using images of snowmen, they have conveyed their message in an understated way. Check here for further holiday marketing campaign ideas. Consider location: Is your shop on a busy street or part of a quiet, high-end department store? This impacts whether you should go ‘all out’ or make the most of a small area. Be clear: Our attention spans are shorter than ever before. Hook your customers in with a concise message. These custom hanging signs emphasise ‘sale’ which will entice customers. Custom hanging signs are an opportunity to take control of your brand image. This store gets it right and it’s important that you do too. Reach out to ODM today: our skilled design and manufacturing teams will make sure that your signage is a hit! An outdoor light box sign will catch the eye of foot traffic. Nescafe’s promotion is attention grabbing and improves brand awareness. Sprite’s display is a good example of an effective in-store display which takes up limited space. This POP display relates directly to the product it promotes. The shape is instantly recognisable. Milka’s POS display reminds customers of the product’s natural ingredients.